Christmas season involves a lot of shopping, and especially gift shopping for all your near and dear ones. 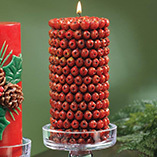 There are many gifts that you can present your friends on Christmas, which they can use for their daily routine as well, but the real charm of the festival comes with gifting something which is authentic to the festival, and one of the most unique things about Christmas are the unique and decorative candles. Candles bring light and warmth to the winter season, and they are also a medium to create an aromatic and relaxed atmosphere all around and especially during the Christmas they become a part of decorations in every room. Christmas candles give a natural sparkling effect to your home decorations along with the electrical Christmas lights. These candles come with beautiful and elegant candle holders in varied colors, shapes and fragrances thereby making them a great choice for Christmas gifts for everybody. A special Christmas Gift for everyone, going along with the theme of the festival, this is a bright red, cinnamon-scented candle. Sits inside this beautiful glass jar and topped by a festive lid is a Santa Claus holding the Christmas tree with gifts around the base of the tree. It measures 4 1/4 " in diameter and 6 1/4" high. 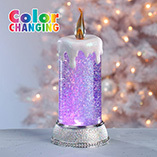 Sparkling glitter makes this Pinecone Candle a fabulous addition to anyone's Christmas decorations. It is made up of wax and dusted with Gold and Copper glitter and comes wrapped in cellophane with a gold ribbon. It has a capacity to burn for 11 hrs. This gorgeous candle can be mixed with real pinecones as a brilliant centerpiece, or queue up multiple pinecone candles along the mantel for an elegant holiday display. 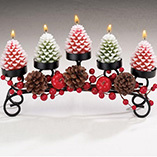 This is a set of three scented candles in green, red and white sparkling colors representing the holiday pleasure. Together they spell "Joy" and rest on a gold-plated metal stand, making a sweet gift to be presented on Christmas, which you can also use to decorate your Christmas dinner table. It measures 9 ½ " in length, 3 ½ " in width and 5" in height. Candy canes are another favorite motif attached with Christmas. 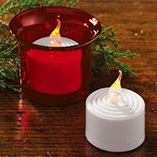 You can make the season merry for your friends and family by gifting them this sweet candle set. They come wrapped in cellophane, with a gold loop for hanging. Kids for their room decorations will especially love these. They are available in green and white and red and white color combinations in round and pillar shapes. These are stylish candles that come in simply structured wax, and can be kept inside a glass holder. These elegant votive candles are best to decorate the interiors of house and especially a spring basket on the dinner table look beautiful with these. Though originally white, during Christmas you can gift these votive candles in various color combinations along with their glass holders. Their usual size is 2 inches in height and 1 and a half inches in diameter. Available in the shape of round balls of various colors, from red and white to golden, these ball candles look very nice and can be gifted in both scented and unscented forms. You can decorate the various interiors of your house with them or can decorate the Christmas tree as well. Gift these beautiful candles to your friends to decorate their houses. A royal and magical ambience could be made on your dinner table through these taper candles. 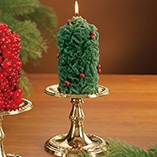 During Christmas you can gift these candles to your fiends that have fluted base for an easy fit into the taper holders. The beautiful metallic holders can also be gifted with them and help your loved ones in decorating their Christmas dinner tables. Just like you have figures of Santa Claus for the candles, there are also various Snow Men waxed candles, available during Christmas. These are available in red and white with a thread coming out from their heads. 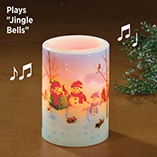 Making beautiful, cute and theme based items these are one of the most popular candle gift items during Christmas. Signifying the light of hope, faith and love, these candles spread as much joy through their brilliance as decorative illumination. So buy these beautiful Christmas candles to gift them to your loved ones.